Most of the gypsy/traveller vehicles that we see near TLCB Towers are not like these. New Toyota Hilux and Range Rovers with private number plates seem to be the preferred choice at the moment, but very occasionally we do see travelling done the traditional way. 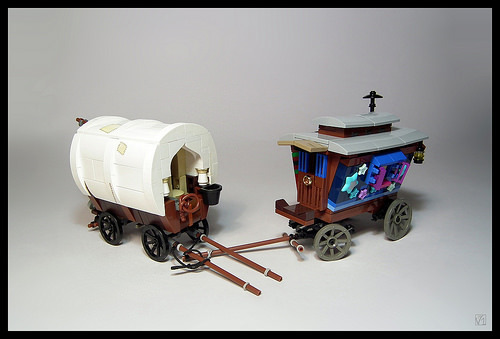 These beautiful Polish gypsy wagons by Flickr’s Karwik remind us of a time when there was only one horse power available up front. Click here to go travelling. Famous for having a front grill that resembled a lady’s, er… you know, Edsel was a heroic failure. But what a cool failure. 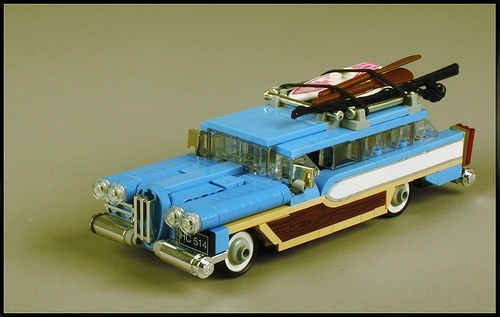 Misterzumbi has built this epic ’58 Edsel Wagon, complete with wood-grain (that’s genuine Lego too) and a roof rack full of beachy things.